To create rich, technologically enabled experiences, enterprises need close collaboration between marketing and IT. Converge explains how the merging of technology, media, and creativity is revolutionizing marketing and business strategy. In the past, marketing and technology were considered two vastly different functions. Nothing could be more different today, argue Bob Lord and Ray Velez, CEO and chief technology officer (CTO), respectively, of the global digital marketing group Razorfish. Marketing is about creating a customer experience, the authors write. And in today’s world of customers enabled by the Internet and the smartphone to be both engaged and demanding, creating a customer experience requires what the authors call the “convergence” of the disciplines and skills related to both marketing and technology. More specifically, convergence is the coming together of media, technology and creativity. All three of these areas have dramatically changed in the past few decades, the authors write. Media is not about one-way communication such as TV ads, but about engaging with customers who control your brand’s reputation. Technology is not about infrastructure, but about identifying customer segments and helping to tell the stories that will bring them to the brand. And creativity is no longer a topdown process. Today, creativity comes from everywhere, including your customers. 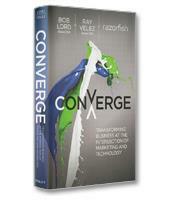 One of the core themes of Converge is that business has never been more customer-driven than it is today. In this new customer-centric world, marketing, the authors write, “is no longer about throwing a message out into the world and hoping that you interrupt the right person at the right time. Marketing has become about service and utility, and much of it is technology enabled.” In other words, successful marketing requires using technology to help customers achieve their goals. • Reject silos. Collaboration across functions is an absolute prerequisite for convergence. • Act like a startup. Go for cheap, fast and flexible. • Adopt a cross-disciplinary mindset. “Get a wide variety of expertise around the table,” write the authors. • Think of your brand as a service.You’re not selling stuff; you’re fulfilling a need. Much of the terminology covered in this text — such as cloud computing and data-mining — will be familiar. Through its explanations and examples, however, Converge transforms these often vague buzzwords into meaningful concepts with clear applications. Cloud computing, for example, allows companies that don’t have the resources of an Amazon to replicate Amazon’s data processing at a much lower cost than through traditional servers. How to make the most of big data, what ubiquitous computing means to your company and its clients, and how to change your processes to take full advantage of today’s “marketing eco-system” are just a few of the critical business topics covered in Converge. Ending each chapter with a convergence to-do list called “Convergence Catalysts,” the authors — consultants responsible for results and not white papers — have produced a clearly written guide to marketing in the 21st century directly aimed at the business practitioner.